I just tried to set up a raspberry gateway according to this https://www.mysensors.org/build/raspberry . Nov 10 22:35:30 INFO  Config file /etc/mysensors.conf does not exist, creating new file. Nov 10 22:35:30 INFO  EEPROM file /etc/mysensors.eeprom does not exist, creating new file. first of all i don't understand why it's not working when there were just top c&p a few lines? This means the Raspberry Pi is unable to communicate with the radio module. The most common reason is a wiring problem. Could you post a few photos of the wiring (from different angles)? Maybe we can help spot a problem. 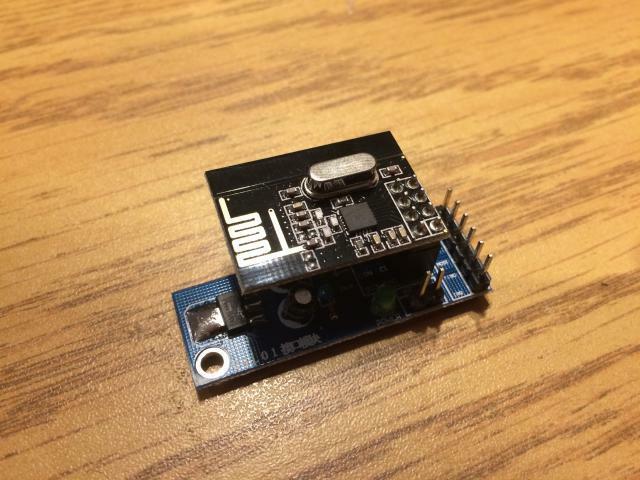 If you have more than one nrf24 module, see if switching helps to check if the radio is broken. @narf I am not familiar with this board but I thought a nrf24l01+ module was supposed to go into the 2x4 female header? Looks to me the reason there is no communication with the radio, is that there is no radio at all. @narf nice work. Thanks for reporting back. is this right? and if so, how can i translate all this stuff? cool cool. now i just have to figure out how to define my items on the openhab part!